The 100 Years of Australian Military Aviation 2014 1oz Silver Proof Coin from the Perth Mint of Australia makes its inaugural appearance this weekend as part a larger centennial celebration marking the evolution of aviation in the nation’s military. These limited edition, 99.9% pure silver coins debut at the Centenary of Military Aviation 2014 Air Show (www.airforce.gov.au/airshow) presented by the Royal Australian Air Force at RAAF Williams, Point Cook, Victoria, Australia. The show runs on the 1st and 2nd of March. "As the birthplace of Australia’s military aviation and the oldest continually operating military airfield in the world, we are exceptionally honored to be launching the 100 Years of Australian Military Aviation commemorative coin at Point Cook," said Perth Mint Sales and Marketing Director, Ron Currie. "We believe the tribute will be highly sought-after by Australian collectors, as well as serving and past members of the Royal Australian Air Force." Shown on the reverse of the coin is a colored design depicting a Bristol Boxkite aircraft — the first military aircraft flown in Australia at Point Cook, on 1 March 1914. The original flight was operated by flight instructor Lieutenant Eric Harrison and signaled the start of a century of military aviation in Australia. "Harrison’s inaugural flight of a Bristol Boxkite 100 years ago is recognized as the starting point of all military aviation in Australia," commented D.W. Gardner, Director of the Royal Australian Air Force Museum. "To mark this military milestone with a commemorative coin is simply outstanding. It is an exceptional keepsake." 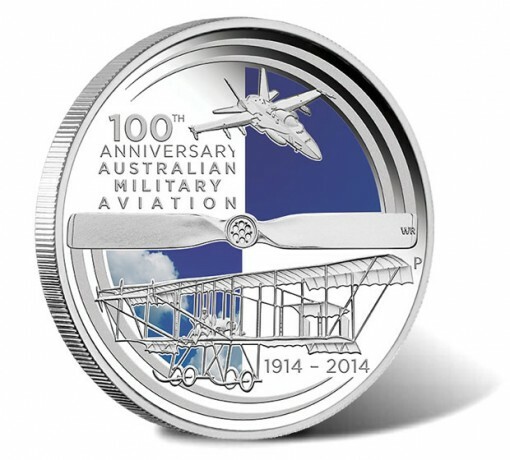 The continued technological advancement in military aviation is demonstrated on the coin with the inclusion of an F/A-18 Hornet fighter aircraft, also on the reverse. The two planes are separated on the design by a Bristol aircraft propeller. Inscriptions include 100TH ANNIVERSARY OF AUSTRALIAN MILITARY AVIATION, the dates 1914 – 2014, and The Perth Mint’s ‘P’ mintmark. Displayed on the obverse of each coin is Ian Rank-Broadley’s portrait of Queen Elizabeth II. The likeness is surrounded by the inscriptions of ELIZABETH II, AUSTRALIA, 1 OZ 999 SILVER, 2014 and 1 DOLLAR. In addition to being available at the Centenary of Military Aviation 2014 Air Show, the new 100 Years of Australian Military Aviation 2014 1oz Silver Proof Coin may also be purchased after midnight straight from the Perth Mint at www.perthmint.com.au. Pricing is listed as AUS $99, but is subject to change based on the precious metals market. Each comes in a Perth Mint presentation case along with an illustrated shipper and a numbered Certificate of Authenticity.